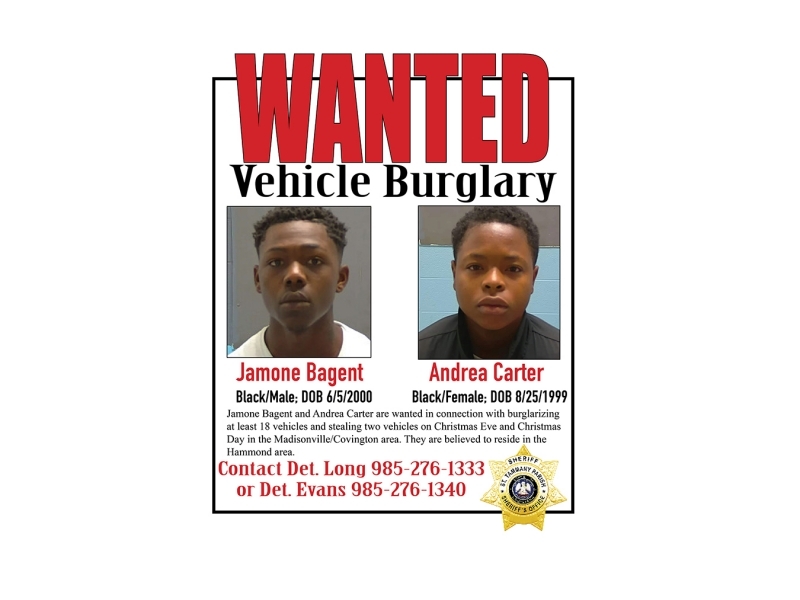 The St. Tammany Parish Sheriff’s Office has identified four subjects responsible for a recent string of vehicle burglaries that occurred on Christmas Eve and Christmas Day in the Madisonville/Covington area, two of which are in custody at this time. All four suspects are from the Hammond area. At least 18 unlocked vehicles were burglarized on Christmas Eve and Christmas morning in the subdivisions of Shady Oaks, Myrtle Grove, Beau Arbre, Tuscany West, Post Oak Landing, Del Sol, Normandy Oaks, Hidden Creek and Maison du Lac. Two vehicles were also stolen, both of which were then abandoned and recovered a short time later. All the vehicles had been left unlocked and the two vehicles that were stolen had the keys left in them. On December 26, detectives with the St. Tammany Parish Sheriff’s Office Criminal Investigations Division began the investigation and were able to identify one of the subjects involved in the burglaries. With cooperation from the Tangipahoa Parish Sheriff’s Office, Damien Kelly (DOB 12/16/2000) was taken into custody in Tangipahoa Parish following a residential search warrant where he was found to be in possession of several stolen firearms. 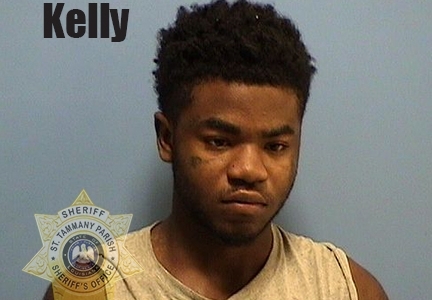 Kelly was later transferred and booked into the St. Tammany Parish Jail. Arrest warrants were issued for Kelly and the other three subjects involved. Kelly was charged with 18 counts of L.R.S. 14:62 Simple Burglary, one count of L.R.S. 14:27 Attempted Simple Burglary, and one count of L.R.S. 14:67.15 Theft of a Firearm. Late last week, Randy Andrews (DOB 9/4/2001) was taken into custody in Baton Rouge on unrelated charges. 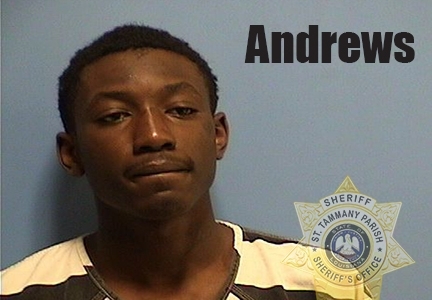 Andrews has since been transported from East Baton Rouge Parish Jail to the St. Tammany Parish Jail and booked with 18 counts of L.R.S. 14:62 Simple Burglary, one count of L.R.S. 14:27 Attempted Simple Burglary, one count of L.R.S. 14:67.15 Theft of a Firearm, and two counts of L.R.S. 14:67.26C Theft of a Motor Vehicle. Arrest warrants have been issued for Jamone Bagent (DOB 6/5/2000) and Andrea Carter (DOB 8/25/1999) relative to 18 counts of L.R.S. 14:62 Simple Burglary, one count of L.R.S. 14:27 Attempted Simple Burglary, and one count of L.R.S. 14:67.15 Theft of a Firearm. Detectives have recovered three firearms, electronics, and other various items that are believed to have been stolen in connection with these burglaries. The investigation is ongoing. If you were a victim or have any information regarding these burglaries, the property recovered or know the whereabouts of Bagent and/or Carter, contact Detective Beau Long at 985-276-1333 or Corporal Dwight Evans at 985-276-1340.